The global pet wearable market to grow significantly due to the growing awareness about the fitness, pet health, and safety. Tech-savvy owners have also shown huge interest in pet wearable as it helps in tracking their pets and helps them in maintain and checking their health. However, pet wearable is currently in its nascent stage and is projected to grow at a large scale in the forthcoming years. The demand for pet wearable is high in developed regions and is also growing intensely in developed regions as well. In a recent report published by Transparency Market Research (TMR), the global market for pet wearable is projected to rise at a healthy CAGR of 12.0% during the forecast period between 2016 and 2024. The valuation of the global pet wearable market is expected to reach US$2.5 bn by the end of 2024 from US$1.0 bn earned in 2016. The global pet wearable market is classified on the basis of technology type and application. The application of pet wearable is seen in behavior monitoring and control, medical diagnosis and treatment, identification and tracking, facilitation, security, and safety. Until now, the application of pet wearable was largely seen in the identification and tracking segment. On the contrary, identification and tracking devices for farm animals and pets is expected to experience marginal decline in the near future. This is because of the availability of similar products that have sophisticated and more advanced features. Based on the technology type, the pet wearable market is divided into radio frequency identification (RFID), GPS, sensors, and others. Among these segments, GPS segment is likely to gain traction in the coming years. This is due to advancing wireless infrastructure and telecommunication technologies that have accelerated to adoption of GPS collars coupled with monitoring devices for pets. The GPS installed devices helps in tracking lost or stolen pets. In addition, the demand for RFID technology is likely to grow over the forecast tenure as it give scope to reshape traditional process and expand its capability. On the regional front, Europe and North America dominates the global market for pet wearable by holding approx. 75% collectively. The demand for pet wearables is comparatively high in these regions due to strict rules for animal safety and treatment and higher purchasing power. Strict regulations imposed by government has forced the people who have pets to buy products such as behavior modification devices and bark collar. Moreover, tech-savvy pet owners prefer to use sophisticated technology and spend largely on pet wearables which will also boos the demand in the pet wearable market. 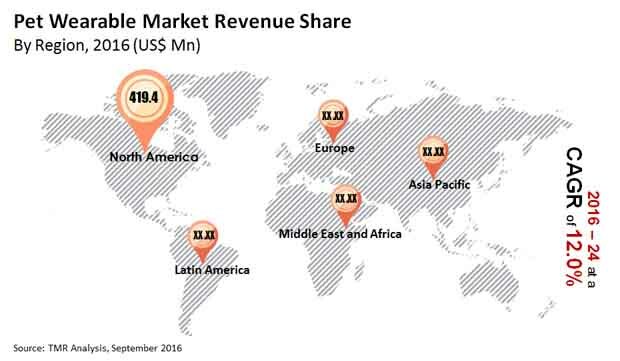 In addition, Asia Pacific is projected to be significant regional market for the growth of the pet wearable market. There the demand for RFID, GPS technology based identification, behavior monitoring, tracking, and control are likely to increase at substantially in the forthcoming years. Lak of advanced telecommunication in various countries in Asia Pacific has posed challenge for the pet wearable market growth. However, this scenario is likely to change in the near future, which in turn drive the market growth. The report also gives the details about the vendor landscape of the global pet wearable market. To mention of the prominent players in the global pet wearable market are Loc8tor Ltd., Nedap N.V., Whistle Labs Inc., PetPace Ltd., IceRobotics Ltd., and DeLaval Inc. The global pet wearable market is envisaged to obtain growth while riding on the increasing application and selection of therapeutic diagnostics for pets. Medical tagging of endangered species, animals, and pets could achieve a sound momentum in the near future. The demand for pet wearables is prognosticated to increase due to the mounting awareness about control and conduct checking of pets, distinguishing tracking and proof, and remote observation. Seasoned analysts study the global pet wearable market to be segmented as per technology and application. In terms of application, identification and tracking currently accounts for a leading share in the demand for pet wearables. The report prepared on the global pet wearable market offers comprehensive chunks of valuable information pertaining to important factors and aspects deemed significant for the growth of industry players. The segmentation study provided in the report is a brilliant account which allows readers to identify hidden opportunities and prospects in different segments of the market. The world pet wearable market is foreseen to be largely advantaged by the advent of new products due to the substantial awareness about pet safety, fitness, and health. Another factor that could mushroom the growth of the market could be the rise of wearable technology in the last two years. Although the market is in its initial stages, it is anticipated to possess a strong growth potential creating a multitude of lucrative prospects in the near future. The market could rise at a CAGR of 12.0% during the forecast period 2016-2024. On the basis of application, identification and tracking could account for a colossal share in the world pet wearable market. However, this segment is projected to witness a slight decline in the coming years. This could be because of the availability of alternate products with more sophisticated and advanced or similar features. The demand for medical diagnosis devices is forecast to increase due to the swelling awareness about pet fitness and health among owners, mainly in Europe and North America. Medical diagnosis and treatment coupled with facilitation, safety, and security could account for more than a 25.0% of the market by 2024. Europe and North America are prophesied to flaunt an aggregate share of close to a 75.0% between 2016 and 2024. These major regions of the international pet wearable market could experience a high penetration of products in the foreseeable future. This could be due to strict animal treatment standards and higher purchasing power of consumers therein. Stringent regulations have obligated pet owners to buy products such as behavior modification devices and bark collars. The adoption of such devices could be catalyzed by the presence of telecommunication technologies and advanced wireless infrastructure. Asia Pacific is expected to garner a decent growth in the international pet wearable market owing to a high demand for radio-frequency identification (RFID) and global positioning system (GPS)-based control, behavior monitoring, tracking, and identification. The regional market could expand at a swift pace during the course of the forecast period.